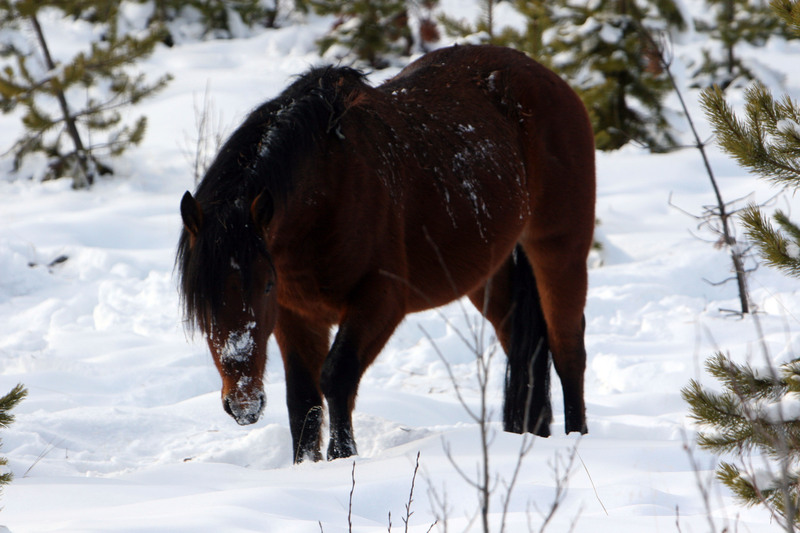 A new year is upon us and the Board of Directors for WHOAS wishes all our members and supporters and of course Lynn and Dave Scott at Northernhorse, who have always been so helpful to us and the wild horses, a prosperous New Years. 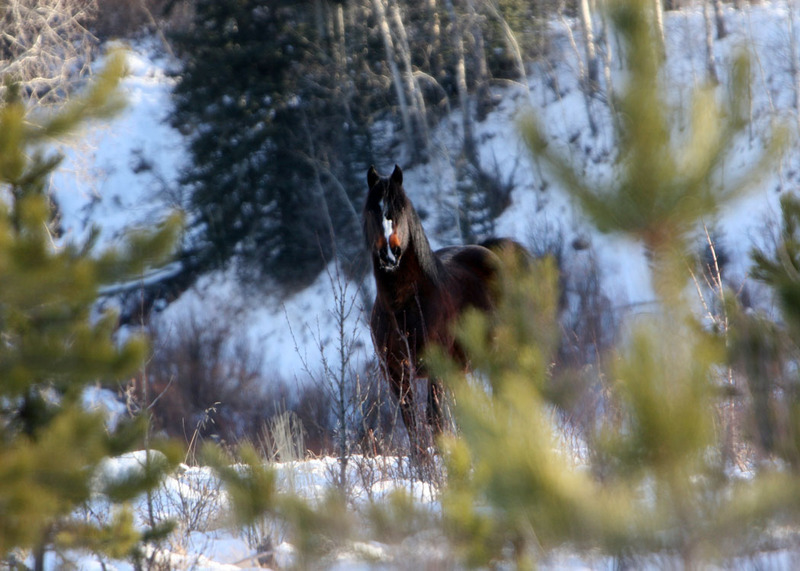 In the wild horse country, things are quiet and with only about 8″ of new snow so far, the Wild Horses are doing fine. The snow is still soft and fluffy allowing the herds to easily paw through the snow for forage. Most of the foals are still demanding mom’s warm milk but have also quickly learned how to paw for their own grasses. The mares know that the time to wean is getting close and it is amusing to watch the little one’s put their ears back and stamp their hoofs when the mare makes them quit the feeding. In our last few excursions we have been blessed to see the golden and bald eagles that winter in the foothills, soaring high above us. To me this is always a good omen. I had the opportunity to take one of WHOAS’s great supporters, who is also a member, out to see the wild horses on December 31, 2010. 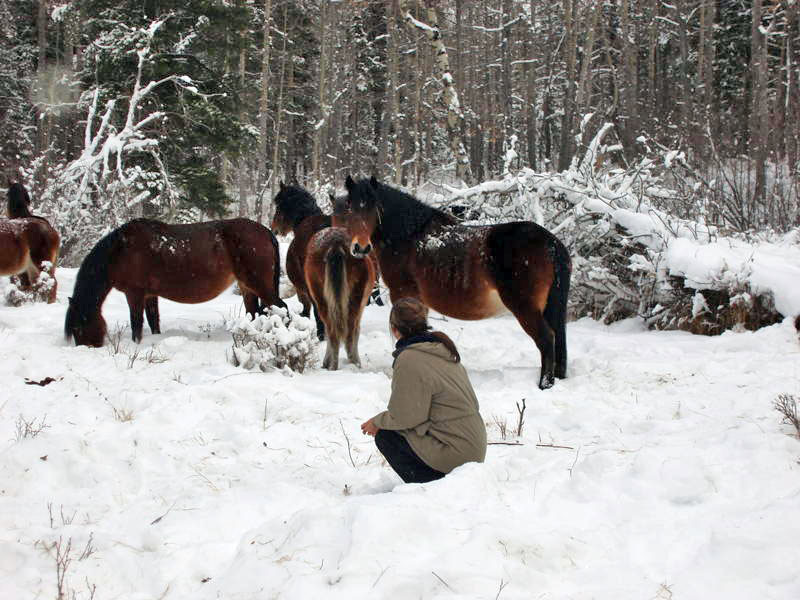 Laura had always supported us, but had never seen the wild horses in their natural environment. This was going to be a great way for both of us to end our year. I met her in Sundre and off we went, west into horse country. The day was a glorious one with fresh snow and sunlight. During the day we saw a good number of horses, but had trouble getting really close to any of them, in order for Laura use her camera to take pictures. Then late in the afternoon we came across a herd of nine horses. I stopped the vehicle and we got out of the vehicle and slowly approached them on foot. As we did they seemed to acknowledge and accept us, especially one of the young mares and the stud.. This allowed us to slowly walk right into the herd. As we gained their trust, it seemed that they knew that we were grateful for them allowing us to join them. In the end we left them to go on quietly feeding and headed home for the day. It was indeed a glorious day and a perfect ending to 2010. We will continue to monitor the horses through out the winter to keep you updated on the things happening in Wild Horse Country. Just a reminder also, that we still do have a few of our 2011 Calendars available if you would like to have one and support the Wild Horses of Alberta.